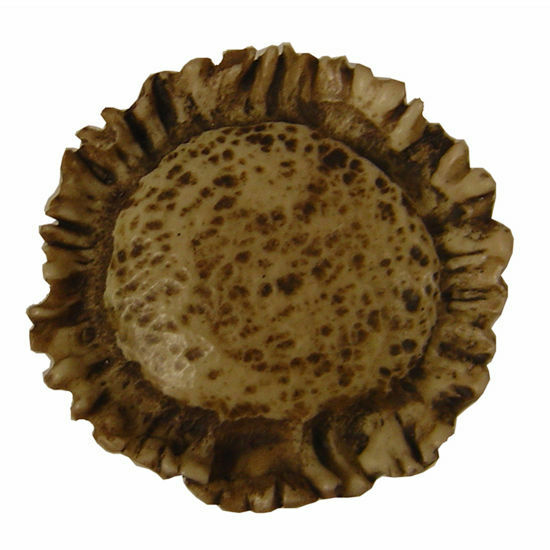 The Cast Resin Collection Pioneer Round Cabinet Knob by Buck Snort brings the beauty of sunflowers to your home. The cast resin finish gives off an earthy, organic look that provides a new twist on the look of a sunflower. The Cast Resin Collection has matching items to coordinate and update your cabinets in your kitchen, bathroom or any cabinetry in your home (each items sold separately). 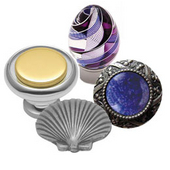 Buck Snort distinctive decorative drawer pulls and knobs cabinet hardware features one piece, cast construction and available in 5 finishes: Antique, Brass, Antique Copper, Nickel, Oil Rubbed Bronze or Pewter. Each piece of cabinet hardware Buck Snort produces are made of solid cast zinc, plated and sealed with a ''Baked On'' Lacquer finish. Each piece is individually packaged and includes the necessary mounting hardware. Buck Snort Cast Resin Collection 8-1/2'' Wide Sundance Cabinet Pull in Cast Resin, 8-1/2" W x 1-1/2" D x 1-1/2" H, Center to Center: 3"
Buck Snort Cast Resin Collection 1-1/2" Wide Buckhorn Left Face Cabinet Pull in Cast Resin, 1-1/2" W x 1-5/16" D x 5" H, Center to Center: 3"
Buck Snort Cast Resin Collection 1-1/2" Wide Buckhorn Right Face Cabinet Pull in Cast Resin, 1-1/2" W x 1-5/16" D x 5" H, Center to Center: 3"